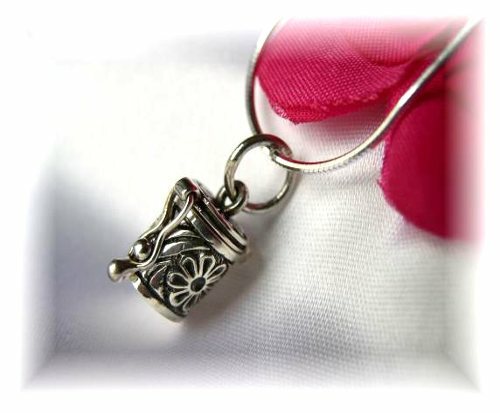 Sterling silver cylinder shape prayer box pendant with flower design�on an 18" sterling chain. This unique necklace features a cylinder shaped sterling silver prayer box pendant with flower design. Hangs delicately from an 18" sterling silver chain with a spring-ring closure for a secure fit. A beautiful accessory for any occasion! Pendant measures approximately 3/4". * Chain styles will vary based on manufacturer availability. Swarovski Crystal Prayer Box Bracelet - Choice of Colors! Chunky style Swarovski crystal�bracelet with bali bead caps and hinged prayer box charm.� Prayer Box bracelets are a beautiful way to express your faith and to remember to pray every day!� Available in 12 birthstone colors!